Despite last night's later night watching the brilliant Olympic opening ceremony, I woke up full of beans this morning. I already had plans to head over to my in-laws today to go mow their lawn and thought as I'm in the area, I'll to the Black Park parkrun. I got up as usual, made my wife some tea and made myself a bulletproof coffee - yes it sounds weird and disgusting, but it is surprisingly tasty. This was only my second bulletproof coffee and I wanted to see how well it and some fruit salad and yoghurt (breakfast) would fuel me for my run and into the morning. 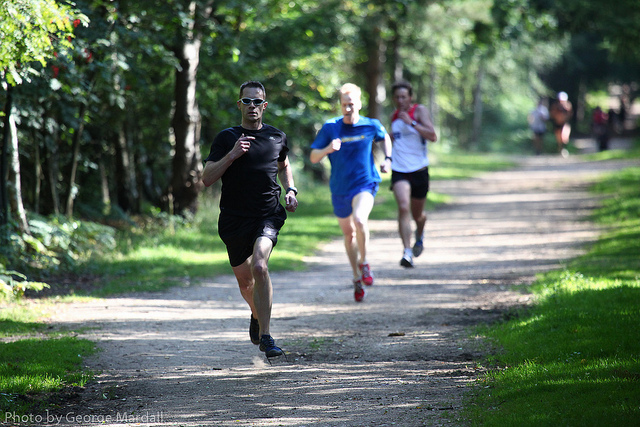 From the course description, it sounded like the Black Park parkrun would be an great run for a fast time, and fuelled by my bulletproof coffee and the vim, vigour and vitality I woke up with, I decided I'd go for it today and see if I could get a new PB. Well, as you can see from the title of this post, I did it, and by a whopping 21 seconds. I set a new PB (by 4 seconds) of 18:29 at the Reading parkrun last week so was very surprised to find I'd knocked such a huge chunk off this week. I think that sub-18min 5k on a fast course like this is definitely on the cards and probably this year, especially as I had the legs to out sprint two guys over the final 200m to claim 3rd spot (out of 284). I'd actually spent the entire run exchanging 3rd and 4th place with the guy who ended up coming 5th (white shirt in the photo below) overall. The parkrun itself is lovely. It is indeed flat and fast thanks to the compact paths, set in a lovely wooded park, but I think the best bit, and the part I prefer most, is the fact is a single 5k loop. It is also a very well attended and well organised parkrun, and guess what, they have no marshalls on the route: just follow the little arrows. If you don't see an arrow telling you to turn, don't turn. Simple really. Oh yes, and I'm convinced: bulletproof coffee is definitely a tremendous fuel for running and fits in perfectly with my high fat, high protein, low carb diet. On Wednesday evening, I'll see how well it goes with my other high fat, high protein, low carb pre-race snack: mixed nuts, which I plan to eat before running the Yately 10k.